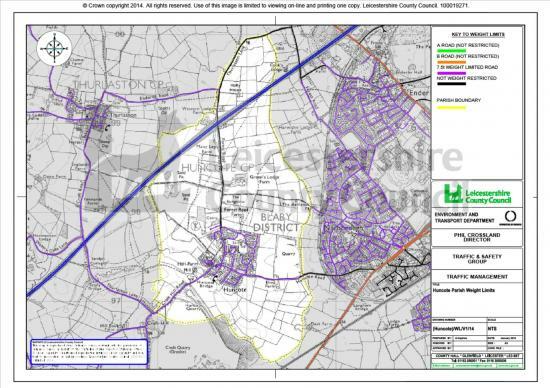 Leicestershire has a designated 'lorry network' of routes suitable for HGVs. In general terms this is the 'A' and 'B' road network, but it also includes a few roads of lower status. Individual reports of suspected contraventions may be passed to the Police by emailing rpu.tm@leicestershire.pnn.police.uk or by phoning 101. Alternatively, to report a weight restriction breach, please complete the form below giving as much detail as possible and we will forward to the Police. Many large vehicles using weight restricted roads are doing so on a legitimate basis, legitimate use include deliveries to/from premises within the weight restricted area; Vehicles whose operating centre is within the zone. Details of when the vehicle was seen. Leicestershire has a designated 'lorry network' of routes suitable for HGVs. In general terms this is the 'A' and 'B' road network, but it also includes a few roads of lower status.Most of the areas between these roads are designated as 7.5t weight restriction zones, where HGVs above 7.5t are not allowed to enter unless they are dropping off or picking up goods within the area. A vast majority of HGVs in the County stick to these routes and of those that use theweight restricted roads, the majority are using the road for a legitimate purpose. Enforcement of 7.5t weight restrictions is the responsibility of the Police and in 2011/2012, 120 complaints were received across the whole of the County, all of which were followed up. This was made possible by the allocation of funding from the County Council to subsidise their operations. Due to reductions in funding for both Leicestershire County Council and the Police, the previous method of handling enforcement is no longer financially viable, so new procedures are being introduced with the aim of continuing to provide an effective service but at lower cost. Reports of HGVs contravening the weight restrictions may still be passed to the Police using their email address, the 101 number, emailing the Parish Clerk or using the form above, but unless resources are available in that area at that time, the incident may just be logged rather than being followed up immediately. However, the information will be used to identify contravention 'hotspots' where a targeted operation may then follow at a later date. However unless it is reported it is not known as a problem. We urge parishioners to report all breaches that they witness. HTML5 validated. WCAG compliant. Page generated in 0.1209 seconds.